From Art Deco to Modern, these pendants adjust in height using counterweights or other pull-down adjustments. A lot of pendants can be used in your foyer, but the Antique Reproduction Foyer Pendants page collects pendants that are taller, perfect for your foyer or entry way. These antique reproduction pendants incorporate historic traditional styling. Open lantern style pendants incorporate elements from a variety of historical sources. With antiqued or painted finishes and intricately designed cages, Antique Reproduction Lantern Pendants enhance a foyer or a high ceiling. Cultured or genuine alabaster in white or sienna as bowls or other pendants bring a classic look to any interior. These pendants have motifs that coordinate with an Art Deco interior. From Hollywood glamour and Steamliner drama to Prairy simplicity and Arts & Crafts fun, Art Deco Pendants draw from a variety of inspirations. These pendants might be perfect for your home. Be sure to take a look at these designs. Tiffany Pendants are available in a wide variety of colors, finishes and styles. Never out of style, these pendants are suitable for many interiors. Art Nouveau and vintage Italian Tole style mini drop pendants are perfect for a shabby chic interior. These unusual small pendants can be used alone or in a series. They are a focal point however they are used. 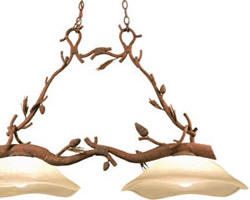 These pendants have dramatic curving lines to coordinate with an Art Nouveau interior. They draw from many inspirations and styles, featuring a variety of finishes and motifs. Use these Small Pendants alone or use a series of them over a bar or island. A unique collection of mini pendants from Fine Art Lamps, PLC, Uttermost, Access, Leucos, Studio Italia Design, Quoizel, Kalco and more. These Small Pendants can be used in place of a table lamp for living area lighting, used over a dinette table or in a series over a bar or dining table. Find pendants on this page from Van Teal, Uttermost, Fine Art Lamps, Studio Italia Design, Quoizel, PLC, Kalco, World Imports, Leucos, Eurofase, Access, Leucos, Illuminating Experiences, Holtkotter, Crystorama and more. Medium Sized Pendants, from 17" to 24" for lighting your contemporary home. In an open floor plan, lighting an area creates a pool of light to separate this area from the larger room. These larger Medium Sized Pendants, from 24" to 30" are an excellent choice for your entry, dining area or to provide ambient light in an open floor plan or living room. Large Pendants, from 30" to 40" make a statement in a larger room or are ideal for commercial or hospitality applications. Pendants on this page are from Van Teal, Artemide, Van Teal, Fine Art Lamps, Uttermost, Kalco, Eurofase, World Imports, PLC and more. At 40" and more in diameter, these very Large Pendants really make a statement. This reflects the scale of a large area and is perfect for commercial or hospitality application. Perfect for a foyer, these Lanterns coordinate with other lighting for a finished look and feel in your contemporary home. Use a single lantern over a round table if you have a high ceiling or a Series of them over a longer table for an exciting new look. This collection of contemporary pendants combine a current contemporary design with the classic appeal of crystal for your sophisticated interior. Drum pendants are a timeless style, appropriate for almost any room. Clean lines and simple styling in a variety of finishes and diffusers are available to suit your taste and surroundings. Inspired by resort lifestyle, this collection of pendants incorporates natural rattan or shells. Add a light cheerful beach feel to any home. Think Hilton Head Island, Key West or Cape Cod, the coast has a different lifestyle. Let your home reflect laid back Coastal Style. Mid-Century Modern style reflects the International and Bauhaus movements mid-20th century. With strong Scandinavian influences, this style features simple design and clean, natural shapes. Poul Henningsen of Denmark strongly influenced lighting styles in Mid-Century Modern style. Modern Mini Pendants bring brushed steel, chrome and glass to a modern interior. Combining form and function, these small pendants can be used alone to fit a small room or area or collectively to light a bar or island. Unique modern pendants up to 18" wide. In a variety of finishes including chrome and brushed silver, these modern pendants are a centerpiece for your modern interior. Midsized modern pendants are the right size for most applications. Over 18" wide, these pendants are the right choice for your foyer, over a table or general ambient lighting. 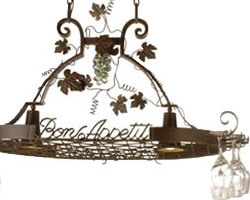 Choose from pendants from Uttermost, Access, Leucos, Eurofase and more. These oversized pendants create an immediate impression. Perfect for a high ceiling, large room, commercial or hospitality application. Choose super sized pendants from Artemide, PLC, Eurofase, Bruck and more. Eclectic style draws from a variety of sources. If you are looking for something surprising and different, these are the pendants for you. If you are looking for something unusual, these are the pendants for you. Fun and whimsical, these unique pendants are for people who know the rules, then choose which ones to follow. Not your typical crystal pendant. Eclectic crystal pendants bring a unique feeling to the timeless beauty of crystal. Oriental pendants draw on Chinese, Japanese or other Eastern motifs. Reflecting the clean minimalism of Japanese or the ornate eclecticism of Chinoiserie, this collection of pendants is timeless. These small pendants include hand-forged iron branches climb, twisting around artisan glass or natural materials. Pendants using rustic materials and finishes are selected for this page to coordinate with Adirondack Style, Lodge Style or fit into your log cabin. Rustic motifs and finishes work from whimsical cabin to rustic Adirondack. Kalco Rustic Pendants can be customized in a variety of finishes, shades and diffusers to create a unique look for your home. Fire Mountain Forge creates unique lighting here in America. This collection of pendants work in a traditional interior. They range from conservative to high style. Timeless classics, Traditional Pendants will always be in style. These small crystal pendants from Fine Art Lamps, Crystorama, Uttermost and more combine beautiful crystal with traditional style and finishes at a variety of prices. These beautiful pendants incorporate crystal into traditional pendants. Available in a variety of finishes, these traditional pendants are timeless. Perfect for a foyer, stairwell, small room, over a small table or in a series over a bar or long table, these traditional lanterns and pendants are right on trend with your traditional interior. Combining the elements of Contemporary Style with a more formal Traditional feel, transitional mini pendants are an excellent choice for lighting your home. Coordinating chandeliers and other lighting are available. Transitional Pendants complement your interior with features of traditional and contemporary style. Transitional and Contemporary pendants incorporating natural materials. The beauty and texture of natural materials add comfortable appeal to your home. 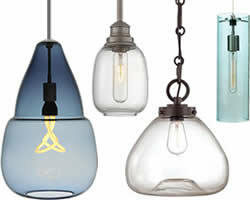 Glass Pendants in cased or blown glass. Suspended from chain, cable or rods these pendants coordinate with a variety of interior styles. Similar to mini pendants, but larger. Bowl pendants reflect light from the ceiling and cast beautiful diffused light through your room. A wonderful source of ambient lighting that coordinates with many interiors. Featuring a variety of finishes with glass, cultured stone and natural materials. Multiple pendants can be used in place of a chandelier. They can be used with a high ceiling and hung at different heights. Use only one canopy to suspend multiple pendants over an island or bar.